From pet-specific shoes to spas for Spike, the pet-care industry brings in billions each year. Small businesses should take advantage. NEW YORK ( MainStreet) -- The pet industry is enjoying growth at a time many other industries are stagnant or shrinking due to the economy. According to the American Pet Products Association, roughly 73 million homes, or two-thirds of U.S. households, own a pet. The association estimates those consumers are spending more than $50 billion, up 5% from last year, on such things as pet vitamins, travel expenses, kennels and boarding, and food treats, among other things. 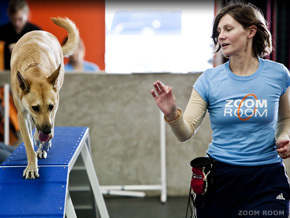 A dog is led through its paces by an employee of Zoom Room, a dog training and agility franchise. Small-business owners should take advantage. "The biggest reason why the market will stand is the humanization trend that's been going on for a number of years," says Bob Vetere, president of the American Pet Products Association. "You see pets treated like family members. It's no longer collars and feeding bowls. It's become so much larger than that." Some of the hottest business trends include organic pet food, computerized identification tags, touch-activated toys, digital aquariums, pet spas and pet costumes -- yes, dressing Fluffy as a lumberjack. "You don't have to go out and invent some patentable, new concept that's technologically innovative," Vetere says. "If you have a pretty sweater that you can knit for a dog -- that's got a niche too. You can cater to both ends." The largest segment of pet owners are baby boomers who have discretionary money to spend and whose kids have left home. "They were called helicopter parents and now are looking to hover over something else," Vetere says. The pet segment is also relatively easy to enter -- not only is there large opportunity for product innovation, but many businesses can be started at home. Vetere estimates the industry adds roughly 200 to 250 serious businesses a year. Many small pet-related businesses don't make it past their first year, though, and approximately 80% of the association's members report annual sales of less than $2 million. Surviving in the pet industry isn't just about creating a cool toy for Fido or filling a need such as a dog-walking service in your local town. Experts say pet entrepreneurs must understand the market they are targeting and the business logistics of their product or service. That's especially important considering that nontraditional pet-product stores are getting into the mix, including: Old Navy ( GPS - Get Report), Paul Mitchell, Omaha Steaks, Harley Davidson ( HOG - Get Report) and Home Depot ( HD - Get Report), the association says. Mark Van Wye, chief operating officer of Zoom Room, a dog training and agility franchise, says pet entrepreneurs need to be cautious in assuming just any idea will succeed in the pet market. "You have to look a little bit within the industry to specific areas" including such straightforward services as dog grooming, he says. "As long as you're long offering evergreen services and products, you don't have to worry." While Zoom Room hosts events such as dog birthday parties, breed meet-up groups and fundraising events, Van Wye says the company caters to "everyday pet owners who want their pets to get exercise and better training. It's something really affordable; people can do it with their kids or significant others." John Nolan, president of Core Marketing and adjunct professor at Pepperdine University's Graziadio School of Business and Management, says pet entrepreneurs should conduct feasibility studies on their product or service before investing money and time into this already crowded segment. "The feasibility study should entail a comprehensive competitive analysis of all existing competitors. You must know their products, features, benefits, pricing and marketing. In a nutshell -- everything about them," Nolan says. Paul Mann, CEO of Fetch! Pet Care didn't have to reinvent the wheel to be successful in the pet industry. He started the pet sitting and dog walking franchise in 2002 after he realized that while there was huge demand for the service, "the problem was with all these pet sitters, they didn't have the full background in marketing, legal, customer service and have the systems in place to run their business professionally." It opened the door for opportunity in an already established market. "What we did was streamlined all the processes and procedures," he says. Fetch! Pet Care has 3,000 sitters on staff and services 1,500 cities and towns in 32 states, Mann says. Customers can find a local sitter online and use the Web to get bookkeeping alerts and report cards, among other things. "In the service industry, it's really about providing great service at the right price whenever, wherever people need it and being able to clearly articulate and promote their brand as much as possible to everyone," Mann says. "No matter where you are or when you need us, you've got a sitter available." Pepperdine's Nolan adds that understanding what channels your product or service will be best sold through is "equally if not more important than knowing whether your product or service compares favorably to your competition. With this knowledge you can honestly asses how you will or will not succeed in the field." PetFlow.com is filling a need by offering premium and specialized pet food through home delivery it says will save owners time, money and hassle. Unlike other online pet suppliers that failed, including Pets.com, the 1-year-old supply company is seeing an opportunity to keep customers coming back by offering automatic refills. "This industry is unlike many others and the reason for that is it lends itself well to an auto-replenishment model," co-founder Alex Zhardanovsky says. "The customer needs a regular, stable supply of similar or identical products on a regular interval." "If we have competitive price, have the product and actually get it to their door, that would mean we would keep that customer on average for the life of the pet. The lifetime value for us is significant," Zhardanovsky adds. "There are not enough businesses in this space taking advantage or even promoting the concept of auto-ship. It's an afterthought." Whereas Pets.com carried practically everything needed for your pet, Petflow.com narrowed its product to premium and specialized food. Even so, its product line has expanded to more than 100 brands of pet food, Zhardanovsky says. The offering is a win-win. Consumers are paying more attention to what they feed their pets, and margins are higher for premium products. Add in a recurring revenue stream by making sure customers are satisfied the first time around and it could be business gold. The idea is so promising that this month the company got a $10 million investment from private equity firm Lightspeed Venture Partners. "Once that 30-pound bag of dog food shows up at your door the first time, you're never going back to the store -- unless they have a huge discount, which is usually not the case," Zhardanovsky says.